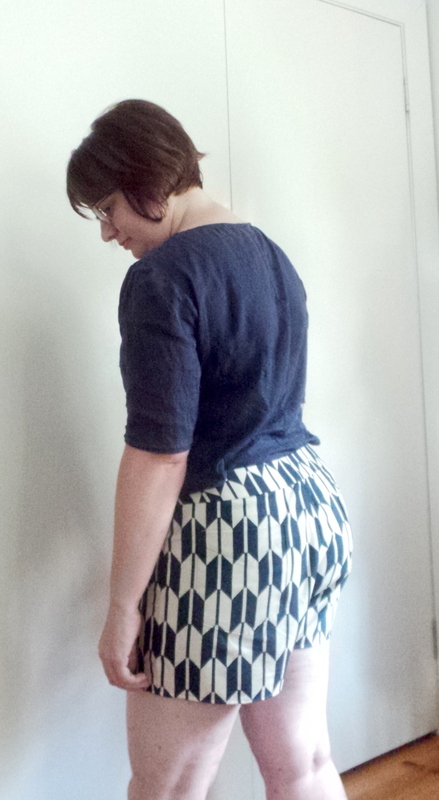 The summer of shorts continue with the Maritime Shorts from Grainline Studio. I am definitely enjoying the increased presence of shorts in my wardrobe and we are only two shorts in which I am honestly a little surprised by. I cut out a size 12 with no alterations. Generally Grainline patterns fit so well I dont need adjustments but I discovering that shorts/pants are a whole different ball game. Overall I am pretty happy with the fit though I can definitely notice some issues. I think I need to investigate the crotch length. 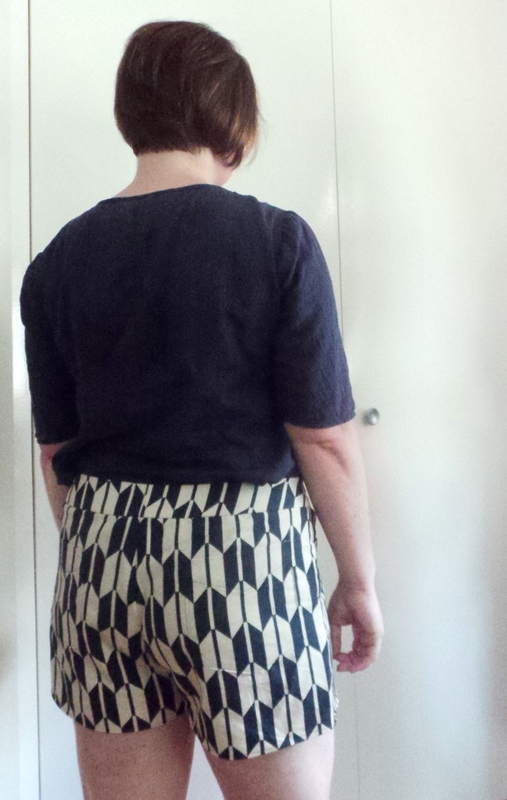 As the shorts ‘wear in’ I definitely felt that there is excess fabric – but maybe I am wearing the shorts too low? (as the length in these pics look fine). The fabric is a duck cloth from Spotlight – but for all accounts it is basically a med weight printed calico/muslim. Pocket lining was a light cotton batiste for the fabric stash, but potentially a little too light weight. This me-made was the first completed project on Singer 99K31 I got myself for Christmas and it handled the fabric like butter once I got the tension behaving. The topstitching went really well – though I am still not used to the speed machine goes at! yikes, no precision projects for this machine yet. Some mean pattern matching was involved. Both back pockets perfectly match and are really only noticeable due to the topstitching. 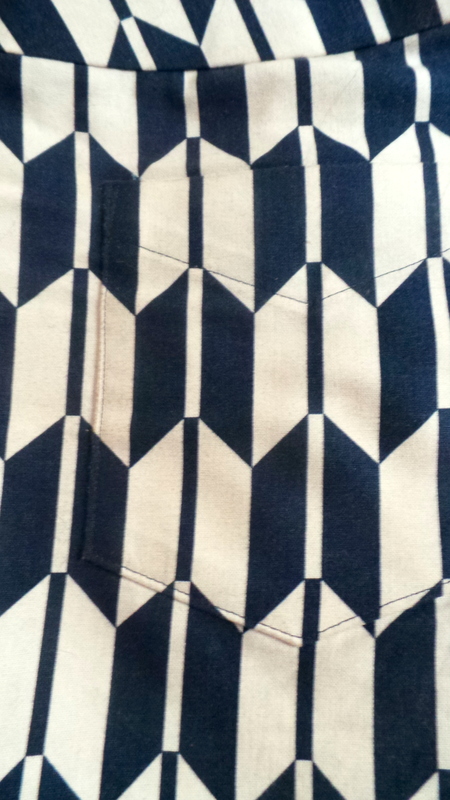 Side seams, pocket facings and back seams are a good match – the waistband was no chance. The shorts have the usual front fly opening, while I have only previously completed two front fly opening before quite successfully. I somehow ended up with one side of the zipper tape exposed. I just couldn’t work out the turning under one side bit in the instruction. 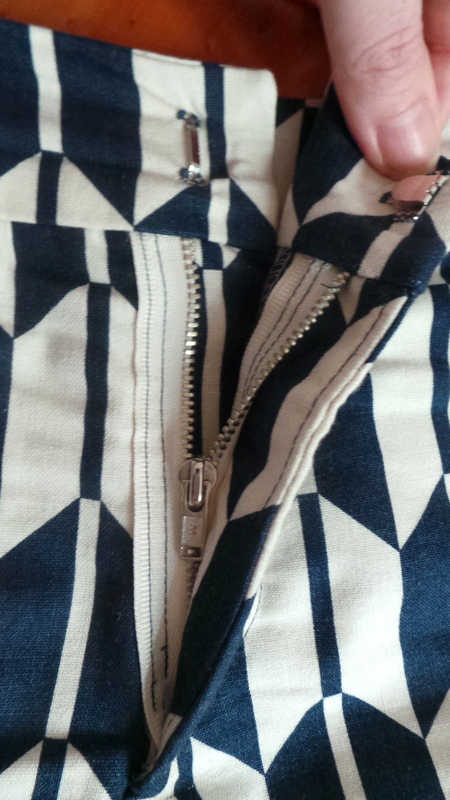 But surprisingly the exposed zipper works. The zipper is a good colour match for the fabric and when the fly is done up – the exposed zipper tape is not showing. Excluding my fly front confusion – everything else went together like a breeze. Jen’s instructions are detailed and clear with just enough illustrations to clear up any confusion. Some things to note for next time – the duck cloth may not the best choice for shorts. As again, a couple of wears in and the fabric around the inner leg is starting to pill but I am beginning to think that this is the nature of shorts . I think I would prefer a bigger hem next time – a more substantial hem I think would suit the heavy weight fabric better. And well obviously as endearing the ‘exposed’ zip may be to some, I really do quite dislike it so next time I need to remedy this front fly insertion method. Oh well, until next time. 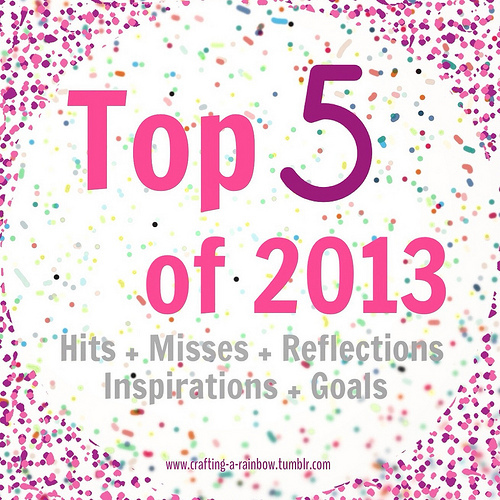 Top 5 of 2013 Hits – or the ones that received the most compliments! Now the good stuff, my hits of 2013. These are the fun ones – a surprising mix of the simple makes and challenging makes. Made from a navy merino jersey from the Fabric Store and another successful extension of the fabric repertoire. Merino jersey is wonderful to work with. The top was a breeze to get together and I was thinking of make a zillion more of the them but the Brisbane summer clicked in a little too this year to warrant it. While the Grainline tiny pocket tee had mention in my misses, the Moss skirt is the redeemer of all. I made this make challenging – my first attempt with denim and top stitching thread along with my second attempt of a fly front. I added the hem band for some extra length. I bound the pocket lining seams with bias binding and ‘fake felled’ seams with topstitching thread. So very proud of my work on this one. 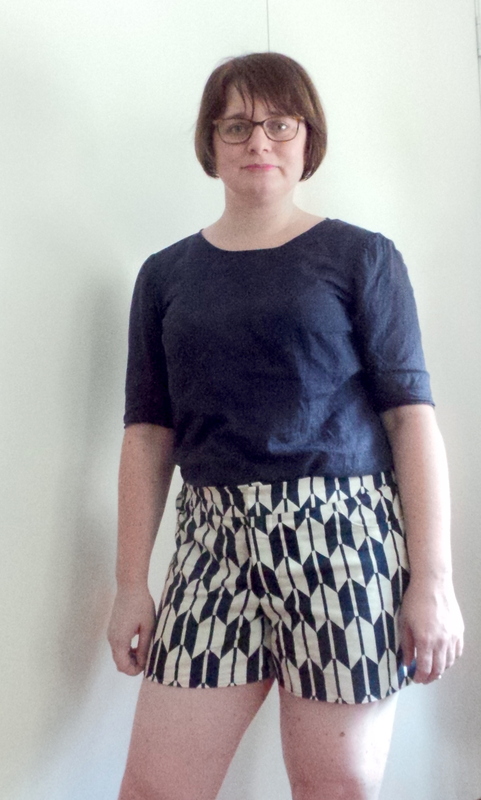 And to make matters better I have lived in this skirt – every weekend since I completed it in April. Worn with tights and my Coppelia top in winter and with my Scout tees in summer. Yes, another Grainline pattern. They really are that awesome. I have made two versions so far of the Scout tees both with silk fabric from the Fabric Store. With each make I mixed up the construction a little – one used my narrow hem foot attachment for the sewing machine to finish the sleeves and hem line, while the other I changed construction of the neck bindings; all with mixed results. These two shirts are seen lots of wear. I see them as the underachievers of 2013 – no strangers gushing over them just quiet admiration. This skirt I made for the Tessuti Gridlock challenge. Tessuti earmarked a jacquard for people to work with and the ability to play with the fabric reverse side is just too tempting to resist. I took the opportunity to use one of Sandra Betzina’s Today Fit patterns – V1333. As the pattern is designed for knits some adjustments were needed. I scaled down the waist, included a side zipper and new waistband using Susan Khajle’s instructions from a timely Threads article. This skirt is FUN to wear – F.U.N. I have received complements from numerous strangers asking where I bought it from “oh this, I actually make it myself”. And if said stranger also sews, I had explain the construction. The skirt makes frequent appearance in my work wardrobe and will continue to do so. Well, that’s it. The hits of 2013 – it does seem strange that the hits are the ones that receive the most compliments from other people. Do I need other people to mention that me-make is good before I think it is good? Or is other people’s comments an affirmation of what I already know. One thing I notice is the hits are frequently worn. Here’s to many more “hits” for 2014. Top 5 of 2013 misses – or how I learn to grow from the missteps taken? Now that 2013 has concluded it is time to join the bandwagon lead by Gillian of Crafting a Rainbow – it has been great to read the hits and misses that appear on my feed each day. It is pleasing reminder that we are not all perfect and the sewing gods do not smile on every me-make project. When the occurrence of the sewing hit occurs – we need to savor it! As these makes are all pre-blog existence I will not bore you will lots of the text and no photos – so I’ll try and keep it brief. Yes, evil. I have been trying to extend my fabric repertoire away from cotton / cotton blend which lead me to try polyester. POLYESTER, oh you horrible horrible thing. During construction there are pucked seams and inability to press. To wear its just gross – in polyester’s defence I do live in Brisbane its hot and humid for the most of the year. But wearing a polyester maxi dress really does feel like I am walking around in cling wrap all day – a hot and sweaty mess. So, silk is pretty awesome (as I will discuss late) but not as pants. I thought I being clever making up a light red silk twill as Sandra Betzina’s V1307 to wear for long haul flights. But during the first leg of a 20 hour flight I noticed the fabric had worn through one side seam. The deteroiation of the pants continued until the final flight home where I was now wearing loose tshirts down to my mid thigh to hide all the worn through areas of the pants. The pants were comfort to wear but I didn’t consider whether the silk fabric would strong enough to stand up to what I intended for the make. Always check measurements for ‘new to me’ patterns. Some patterns just don’t suit me and when they are questionable I really should do a test first or at least check the flat measurements on the pattern. I love using Grainline patterns (again I will discuss further) but the Tiny Pocket Tank just didn’t work. I was pushed for time so I went head first in and cut out my shell fabric without checking beforehand. I noticed that the fabric was a little sheer so being the good little sewist I underlined and well since it was underlined I may as well go the whole hog and hand stitch the bindings to underline and hand roll the hem. WRONG. I went to all this effort to then try the top and err WAIT, WHAT, oh REALLY?!? Never worn again! URGH what was I thinking, why didn’t I check the fit beforehand. Its just two pattern pieces for crying aloud. Why didn’t I check during construction! So here’s to 2014 – Let’s hope I have the good sense to learn from my misses!